With The Conqueror's Shadow, Ari Marmell brings a welcome seasoning of wit to the genre, proving that dark fantasy can address the enduring questions of good and evil and still retain a sense of humor. 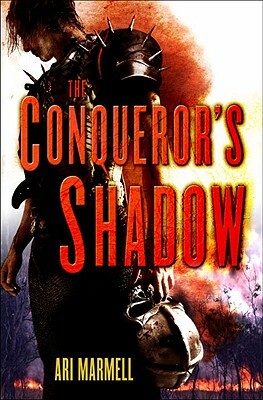 Playful yet intense, sharply sarcastic yet deeply sincere, The Conqueror's Shadow announces the appearance of a unique talent and an antihero like no other. They called him the Terror of the East. His past shrouded in mystery, his identity hidden beneath a suit of enchanted black armor and a skull-like helm, Corvis Rebaine carved a bloody path through Imphallion, aided by Davro, a savage ogre, and Seilloah, a witch with a taste for human flesh. No shield or weapon could stop his demon-forged axe. And no magic could match the spells of his demon slave, Khanda. Yet just when ultimate victory was in his grasp, Rebaine faltered. His plans of conquest, born from a desire to see Imphallion governed with firmness and honesty, shattered. Amid the chaos of a collapsing army, Rebaine vanished, taking only a single hostage the young noblewoman Tyannon to guarantee his escape. Seventeen years later, Rebaine and Tyannon are married, living in obscurity and raising their children, a daughter and a son. Rebaine has put his past behind him, given up his dreams of conquest. Not even news of Audriss an upstart warlord following Rebaine's old path of conquest can stir the retired warrior to action. Until his daughter is assaulted by Audriss's goons. Now, to rescue the country he once tried to conquer, Rebaine once more dons the armor of the Terror of the East and seeks out his former allies. But Davro has become a peaceful farmer. Seilloah has no wish to leave her haunted forest home. And Khanda . . . well, to describe his feelings for his former master as undying hatred would be an understatement. But even if Rebaine can convince his onetime comrades to join him, he faces a greater challenge: Does he dare to reawaken the part of him that gloried in cruelty, blood, and destruction? With the safety of his family at stake, can he dare not to? Avi Marmell has an extensive history of freelance writing, which paid the bills while he worked on improving and publishing his fiction. He has published a fair amount of shared-world fiction, including several short stories and "Agents of Artifice," a Magic: the Gathering novel, but The Conqueror s Shadow" "is his first wholly original published book. Marmell lives in Austin, Texas, with his wife, George, and two cats."